This file is nasty for 2 reasons. Firstly, it uses non-embedded CID fonts, so it is not really cross-platform. It relies on the PDF viewer finding a suitable match for it (rather than displaying exactly what was intended). The PDF spec sets out a very sensible set of rules, but does not enforce them, so creation tools can do silly things. More seriously, here is an excerpt showing the data for one of the fonts in the PDF file. The Adobe PDF file spec includes lots of flexible ways to map data onto specific glyfs and this is usually set by the Encoding value? So what is the correct encoding to use with this PDF file? 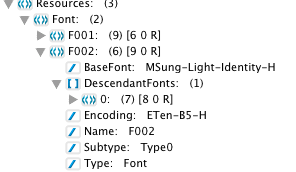 The actual answer here is to ignore the Encoding value (ETen-B5-H) and use Identity-H (from the BaseFont name)…. I was actually surprised that this PDF opened in Adobe Acrobat, but it does and it now opens correctly in JPedal as well. It is a really good example of how you often have to ignore the spec if you want to open some PDF files. where can i find the tool for viewing the internal of pdf file as shown in the pic in this article?